And it was a thing of beauty to watch, for fans who view coaches as interesting or influential as any athlete. Even if they're 80 years old and are baseball's Winston Wolf, just waiting for the call to clean up someone else's mess. The first sign things were different under Captain Jack's watch was the benching of Hanley Ramirez. Ramirez didn't particularly hustle on Sunday, so he sat Monday. Unstated was the calling-out by emerging clubhouse leader Logan Morrison, but old-school McKeon lets some things be handled in the locker room, where they belong. But we've seen this before from Hanley. Last year and two managers ago, he remained petulant after being pulled from a game for a lack of effort, refusing to apologize and claiming he'd lost all respect for Fredi Gonzalez. We could have been in for a repeat, but McKeon knows what he's dealing with. What To Do With Hanley Ramirez? "Just give him a day," McKeon said, and batted Ramirez cleanup last night for the first time in his career. Ramirez went 2-for-4, scored twice, Jack pulled a pitcher in the middle of an at-bat, and the Marlins snapped their franchise-record losing streak. And then he mistook "Twitter" for a dog's name. 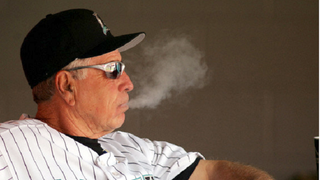 God bless you, Jack McKeon.